Two years ago, workers were harvesting peat at Cashel bog in Co. Laois, Ireland, when they uncovered another bog body, the well-preserved remains of a human sacrifice typically dating to the Iron Age. As sometimes happens, the milling machine did some damage but the victim was pieced back together. He was an adult male with short-cropped hair, found lying on his right side with his knees tightly bent. 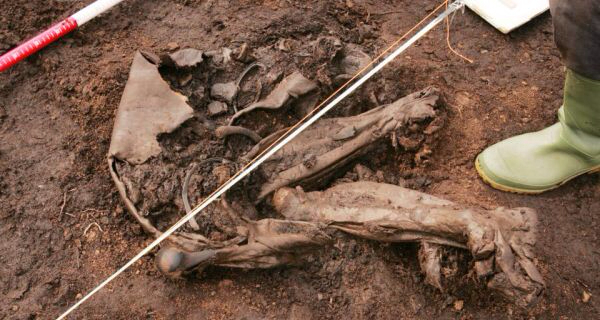 Preliminary reports described his torso as a leather bag from which his legs protruded (IMAGE ABOVE) and an initial examination by Eamonn Kelly, Keeper of Antiquities at the National Museum of Ireland, estimated that Cashel Man had been deposited in the bog 2,000-2,500 years ago. The remains were moved into chilled storage immediately after discovery and constantly sprayed with water to mimic the conditions that had preserved him. Plans were made to conduct anatomical and pathological examinations, x-ray and CT scans, carbon dating, testing of his hair, analysis of his stomach contents, and bathing of his body in ultraviolet light to reveal whether he had any tattoos. The results of some of the tests are in and they have astonished the researchers who performed radiocarbon tests on the corpse itself, the peat on which it was lying, and a wooden stake found with it. Cashel Man lived during the early Bronze Age, around 2,000 B.C., making him 2,000 years older than any of the hundreds of other bog bodies discovered in the world! This should prove very interesting!